Which logo do you prefer? I think this poll is missing at least one alternative. I did not originally consider the wordmark a logo, but I am thinking of posting another poll where you’ll get to pick between the wordmark and the winner of this poll. In this poll, I voted for the Griffin, but I like the wordmark the best! Wasn’t sure about just the type mark but seeing it on the ng 9-5 I think it really reflects the simple Saab philosophy, if it still remains the same in the future that is. Agree but the SAAB name; as used on the Griffin and 9-5 NG, is in fact not a logo. I do like these thick letters on the back of the Saab car but the logo still is on the front of the car and that is what we now vote for, isnt’t it? “KIA” is just lettering in an oval. I like SAAB as the font itself is identifiable as a logomark. I always liked the 900s in the the 80s that had the SAAB lettering/logo. Simple, effective, uncluttered. 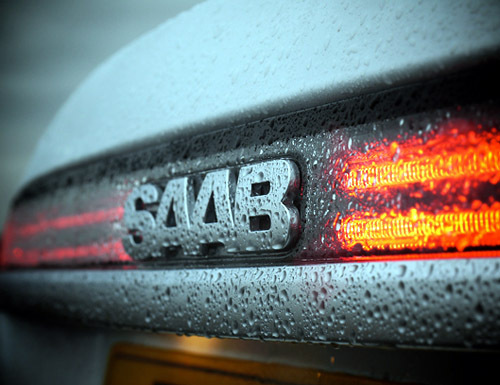 Does anybody know what does symbols in the old Saab logo mean??? My absolute favourite is the plane with the current SAAB word mark. It would appear (from my five minutes of Googling) there really isn’t much on the subject, but now I’m very curious as to what it means. Truly, if someone knows what the Ursaab logo stands for I’m very curious to know more about it as well. My personal favourite logo is the Saab Scania blue roundel. An additional note I want to make: Assuming that the Saab name can be used, I would argue use of the SAAB wordmark … in addition to the airplane logo (by itself) would be ideal. Imagine a Saab steering wheel with the airplane logo by itself. It would look pretty slick! I agree. The slanted letters would probably have to go. I like the logo usage on the PhoeniX concept — which includes a version of the steering wheel you are thinking of (see http://saabsunited.saabklubben.se/2011/04/phoenix-european-tour-2011-trollhattan.html). Yes, that is Getting close to what I’m envisioning. For actual production cars, the airplane logo wouldnt fill the center of the steering wheel but would be the emblem in a smaller size. We can have this same emblem in the front as well but in the back: I would argue in favor of having the SAAB wordmark. An alternative to the airplane logo would be a completely new picture of the griffin. Perhaps even a combination of a new Griffin and the airplane logo would be interesting. I think the airplane logo is not one we could use though as I seem to remember with the Phoenix back brake light that we were told that logo is owned by Saab AB. I may be wrong but who knows now. I love the old airplane logo, but to me that’s part of the past. The color version looks great too. Like it very much, where to get it?? …and you know this, how? Not sure how it works in Sweden, but in the U.S., the government has plenty of influence (that we find out about years later) in matters that their big nose shouldn’t be in. Unless you have spies who have been all over the place—-and phone logs/phone call recordings, you have no idea what influence the government has exerted on the players in this tragic saga. And here in the US: Obama was born in Kansas, the economy is at 89%, everything is made in the USA! Wordmark is the only thing I see on my 1980 900…and it is my favorite. Wish you would have included the Griffin Saab Scania logo that preceeded the Saab Griffin logo. There Should have Been the 4th choice “SAAB” and it does not wash off with the weather! 5th choice. A round dark (retro) blue emblem for hood and wheels with the SAAB wordmark in shiny silver made using paint and coating that lasts 50 years. I understand why they changed the Griffin logo into the word-mark logo SAAB. Their supplier couldn’t deliver ones that stood the test of time. The rear one on my 2010 9-3X seems already to getting bad……… After two years!? For some reason they designed the badges to fail and the cars to hold up well. in combination with the airplane (without letters) applied to hubs and steering wheel. How about a logo that will remove the bad GM taste. out of everyone’s mouth! +1! I would prefer that, too. Give fantasy full scope. A pixelated version of the Phoenix airplane logo on the rear. Personally, I’m a fan of the Saab Scania interlocking rings logo, it’s what I grew up with, and sentiment is a big reason I’m here. According to news sources, – NEVs are not given the right to use the griffin, BUT the company PARTS are given the right to use it!